Generally, yes but not in that outfit! 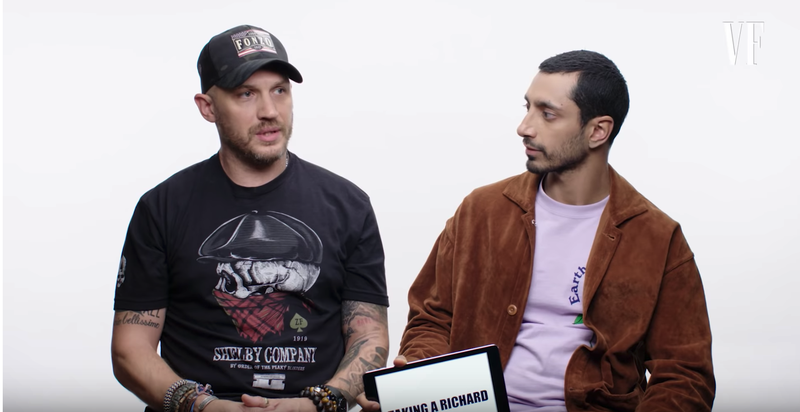 Though this video of Tom Hardy and Riz Ahmed breaking down British slang is roughly six days old, it has stirred the pot once again on whether or not Hardy—the one on the left with the appalling tattoos—is my boyfriend or not. Everything about this video is engineered to convince the public that either one of these men is someone’s boyfriend. Both are attractive; both have British accents; both are famous and have money enough to buy nice things for themselves and also maybe for you (or me). The Jezebel staff debated this morning whether or not Tom Hardy is hot—some said yes, some said no, but for some reason, we could not agree. Normally, a simple Would U would solve this conundrum, but whether or not we Would Hardy is not up for debate. He’s a Would, but a Would is not always a boyfriend. Is Tom Hardy a boyfriend? Simply talking about British slang and being charming is almost enough at this point to convince me that Hardy, a spiky-haired bruiser with truly appalling bracelets, is and could be the person that I eventually end up with—an archetype of a man who will throw a mean right hook in your honor and will later require you to wait up by the phone wondering whether or not they’ll come home from the bar with a tattoo of the Union Jack on their rippling right bicep. That’s a fate I wouldn’t wish on my worst enemy, but also, maybe it is. Various arguments against Hardy’s hotness were centered mostly around how, in certain lights, he resembles a cop from New Jersey. The hair, when spiky, as it is in this video, is not really hair that works for a man who is hot. Put the same man in a shearling jacket and flatten the soft hair, and then we have a different argument. An Instagram account, dedicated to photos of Tom Hardy holding puppies, is compelling evidence in support of his hotness. I wouldn’t mind being held like a small, velvety puppy in the strong arms of Tom Hardy. Maybe he smells like motor oil, gasoline, barber shop, and cigarettes: an arresting olfactory experience, that, because my mind is poisoned by stereotypical depictions of American masculinity, reads hot. I apologize for my specific strand of brain worms that have led me to this conclusion, but I feel compelled to inquire within. Tom Hardy’s hotness is not up for debate for me.